Okay Joeheads… When you’ve got a spare moment, close your door, grab a cold one, put your feet up, and prepare to be humbled. 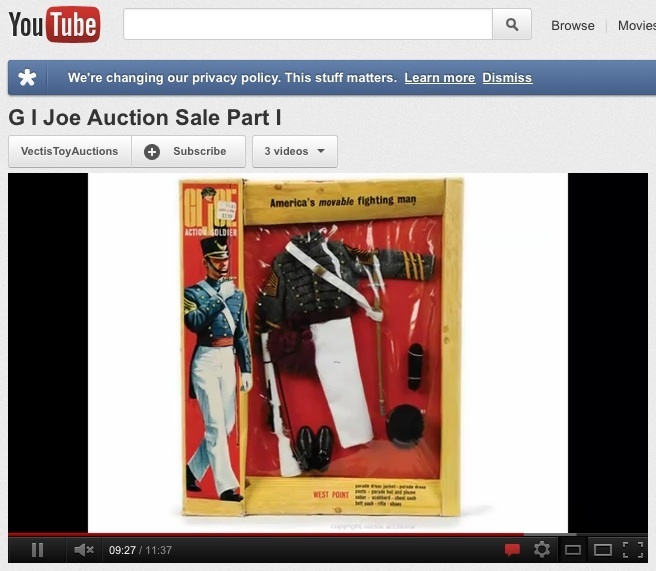 There are now 2 new videos out from Vectis Auctions detailing all the amazing vintage GIjOE product that will soon be auctioned off in their upcoming auction. As we mentioned in an earlier post, this important sale takes place in the UK on March 29th, but you can bid from anywhere online. Here again is the link to the Vectis website. And here are the links to their two new videos. VIDEO 1 and VIDEO 2. There’s no better way to get “psyched and ready” for this event than by watching these! Club President Ron Biallas in 2008. 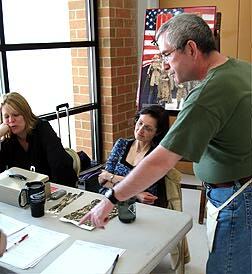 Kevin Bolger checks the attendance list during the 2010 Show. 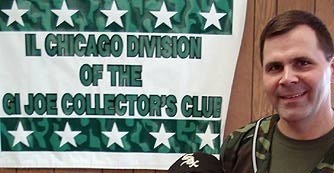 “To paraphrase Mark Twain, the rumors of the demise of the Chicago GIjOE Club are greatly exaggerated. 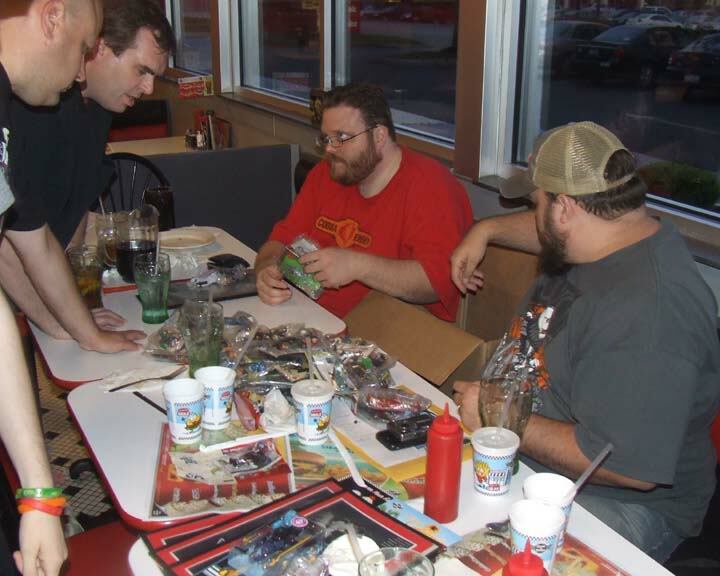 Unfortunately, life has interfered with the hobby for many of us, but we still get together a couple of times a year. Please don’t base our “demise” on fewer Trenches posts or not always hosting an annual show. We’re entering our 13th (?) year as a club and we’ve seen folks come into the hobby and go out of the hobby, but the “lifers” like me are still here. In fact, for those of you in the Chicago area (or who don’t mind making a little trip), please join us on Saturday March 10th from 10am – noon at the Schaumburg Township District Library (Schaumburg & Roselle Roads). We’ll be meeting on the 2nd floor in the Rasmussen North Room. Fully RC vehicles were seen at previous shows. Bottom Line: It’s hard to keep a good club down. 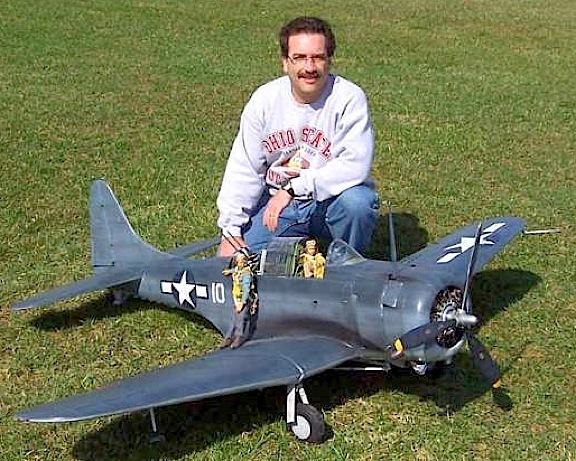 You guys have always done a tremendous job supporting our hobby. If you’re interested in what the Chicago club’s previous shows looked like, here’s coverage of 2008. BEST 1:6 Scale Adventure Team Animation EVER! 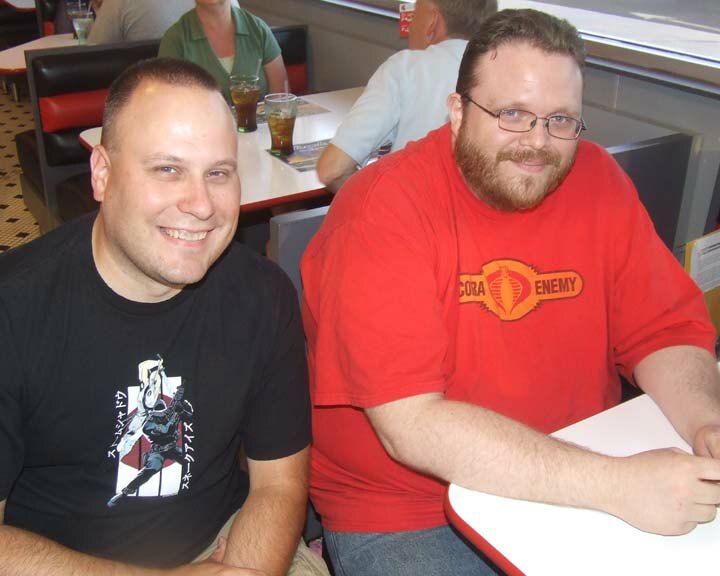 I first met Dana Rausch from Picture Box Animation at the 2009 GIjOE Convention in Kansas City. What a great guy! 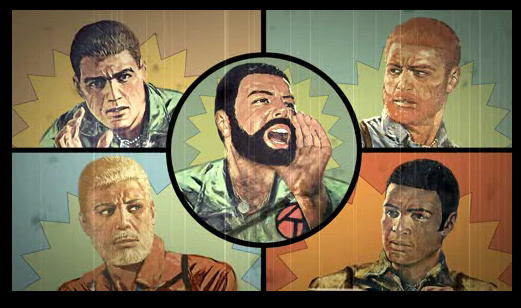 His amazing 3-D animation of the 1970s GIjOE Adventure Team absolutely ROCKED the Con that year, garnering him the 1st place prize in a landslide. Three years later, his fans are still eagerly awaiting whatever GIjOE-related sequel may be forthcoming from his talented mind. Take a moment to re-watch the original (shorter) version of his groundbreaking video HERE. When you’re done, please send Dana a complimentary email HERE. 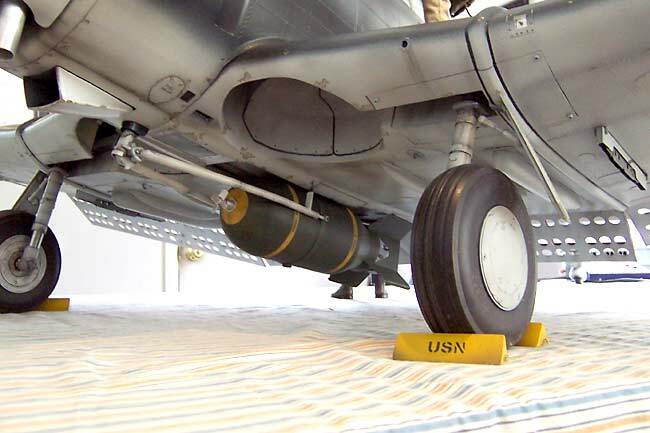 Even the underside is fully detailed. (Photo: Tom Pierce) Click to enlarge. Gunner checks out his station. (Photo: Tom Pierce) Click to enlarge. Bottom Line: Very well said! Take a GOOD look at the photos of Tom’s amazing masterpiece. 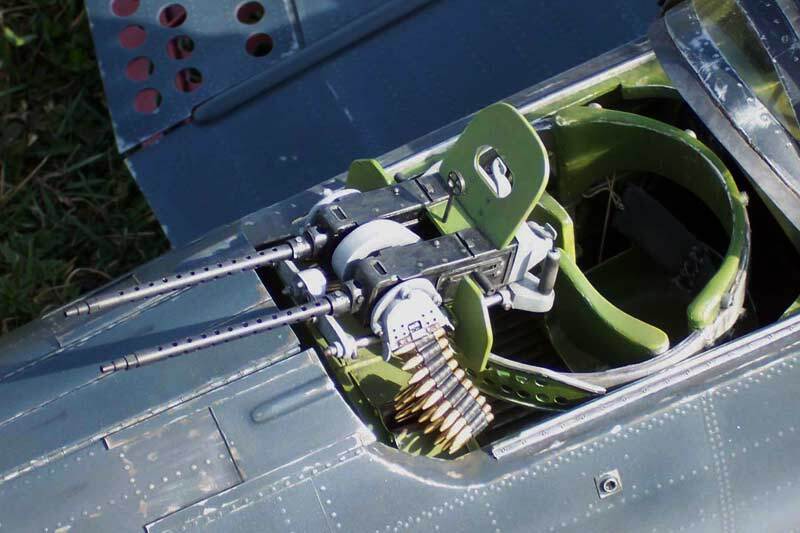 If you’d like to learn more about its construction and final fate, we recommend you visit Pierce’s website about the plane HERE. 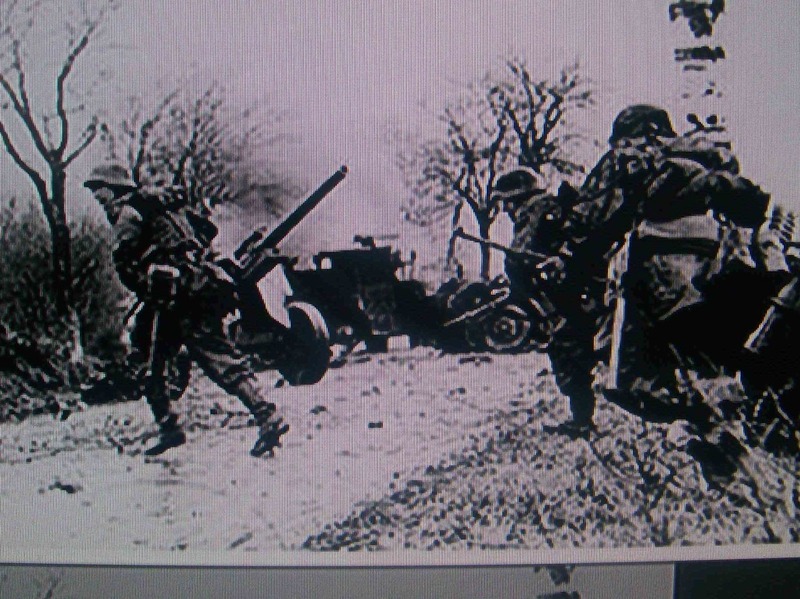 The original WW2 photo that inspired Peter's 1/6th scale recreation. 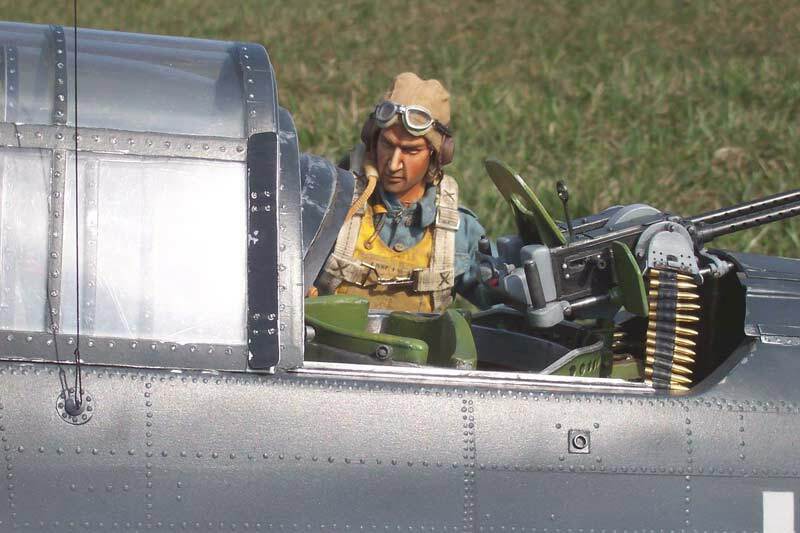 Here’s a creative and enjoyable offshoot of the 1/6th hobby that many fans haven’t yet tried or even considered possible. Others, such as “Peter the Painter” from the UK continue to prove that indeed, it is VERY possible! 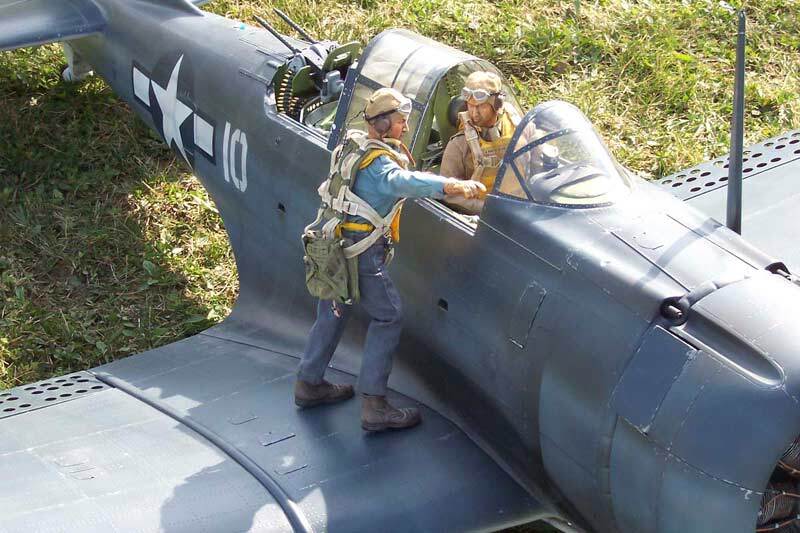 We’re talking about the recreation of exciting images captured in vintage photographs taken during WW2 or other periods–in miniature 1/6th scale. 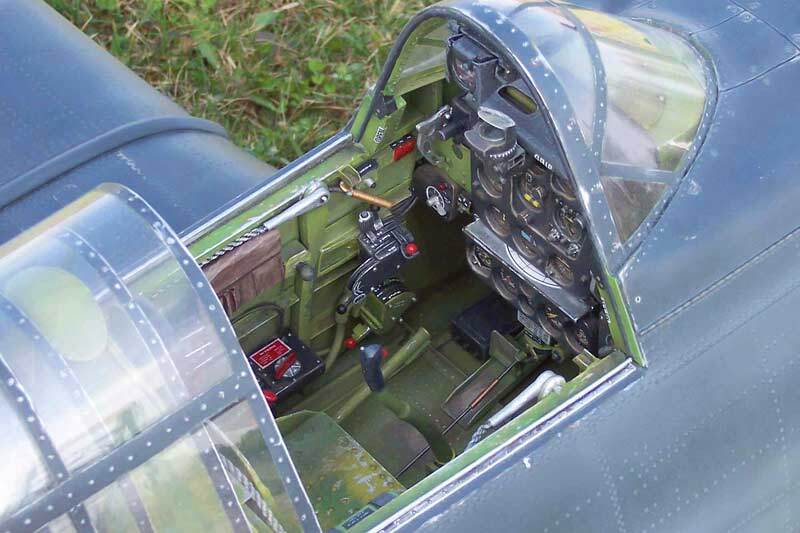 Peter's stunning 1/6th scale recreation completely "fools the eye!" 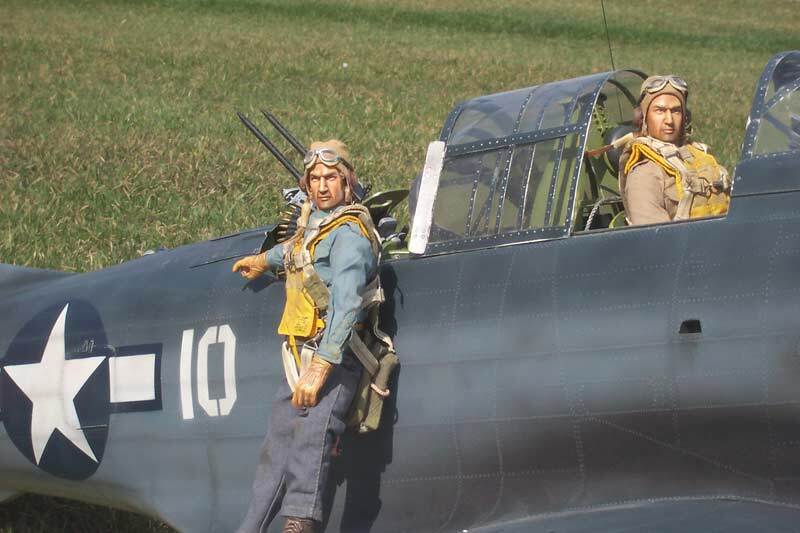 Peter recently posted some prime examples of this artistic endeavour over on the OneSixthWarriors forum, clearly showing what IS indeed possible with just a little care and creativity. 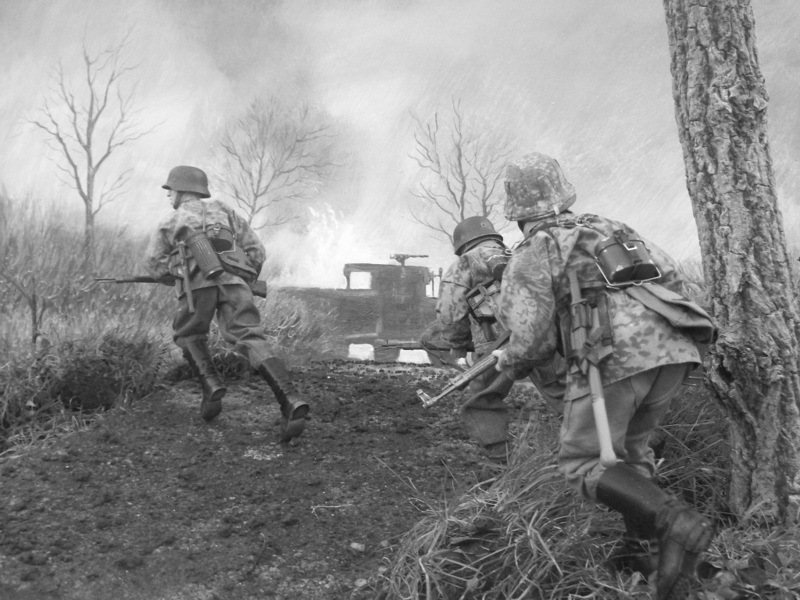 He chose an old, grainy photo from the Battle of the Bulge, showing 3 german troops running quickly across a dirt road. With great care, he painstakingly recreated the moment with exacting perfection. What a masterpiece! In this final, colorized version, Peter brings the past to life! Take a good look at the first “inspiration” photo (above left), then Peter’s amazing black and white recreation (above right), and finally his full-color version (left). 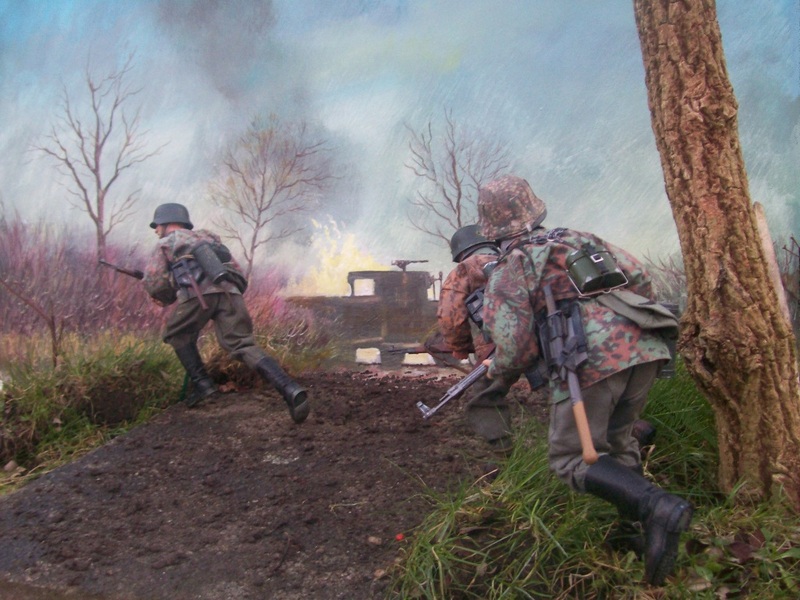 Upon extremely close inspection, you might be able to detect that Peter has used a combination of miniature trees, grasses, some dirt and even a hand-painted backdrop. Put all together, the final result is completely convincing visually. It’s as if you were standing right there on the road at that moment. Superb work, Peter! Please keep up your inspiring work. JOhio GIjOE Club Largest in the U.S.
Wow! With balloons and cameras involved, Joe “parachuting action” is likely to follow soon. Sounds like a really cool idea. 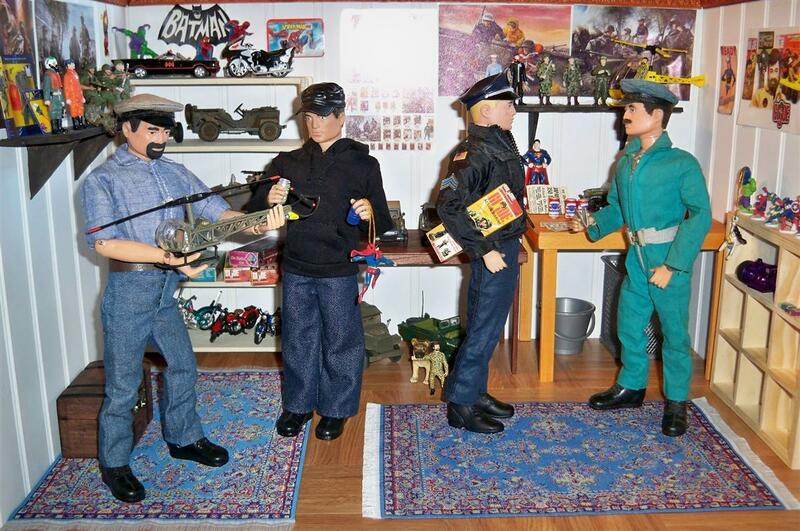 We wish members of the JOhio GIjOE Collector’s Club all the best with their future plans. GO JOE! 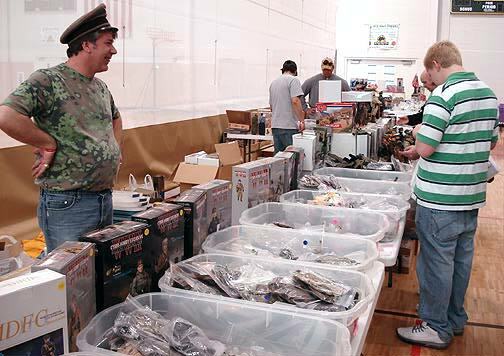 “CoilCon is the midwest’s largest GI Joe convention. Now in it’s third year, the Con continues to grow in attendance and number of special guests and vendors. The past few years have seen a great mix of hanging out with the community, CoilCon Exclusives, swap meets, great vendors, Joe Con and SDCC Exclusive give-aways, and so much more. The grill will be going for lunch with hot dogs provided. Feel free to bring your own meat, sides, chips, or whatever. Cold water and soda will be available for $1.00 each. You are welcome to bring a cooler of your own beverages if you prefer. Bottom Line: The Coil is mainly a 3.75″ GIjOE collecting group, but they do have a few 12″ fans involved as well and there’s always room for more. Sounds like a good time! Rick’s amazing miniature Joe Room in 1/6th scale. (Photo: Joemanri) Click to enlarge. What a stunning achievement. AMAZING work, Rick. It’s a miniature masterpiece. Congratulations! 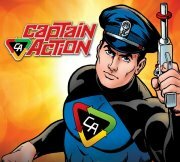 Good ol’ Captain Action continues his recent “resurrection” from the 1960’s “Land of Forgotten Toys” with a Captain Action Facebook page. 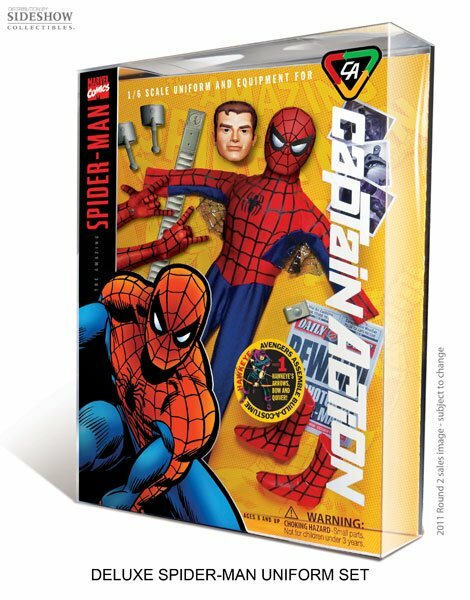 It’s still relatively new, but the page already has over 1400 “Likes” and looks certain to be a popular place for all fans of Cap, Kid Action and Dr. Evil. Take some time to look around, drool over great pics of upcoming toys and leave a comment or two behind. 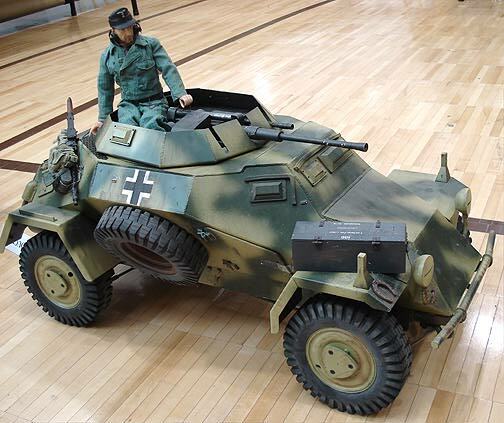 The new toys are due to appear very soon and they’d love to hear what collectors are thinking!